The program is designed to encourage research and promote the study of cultural, political, historical, economic and social aspects of modern and contemporary German affairs from an inter- and multidisciplinary perspective. Undergraduates with at least junior (third-year) standing pursuing a German Studies track or minor may be nominated for the grant by their department and/or program chair. Applicants are expected to have completed two years of college German and a minimum of three courses in German Studies (literature, history, politics or other fields) at the time of nomination. Master's level graduate students in the humanities and social sciences earning a certificate or working on a project in German Studies may be nominated for the grant by their department and/or program chair. 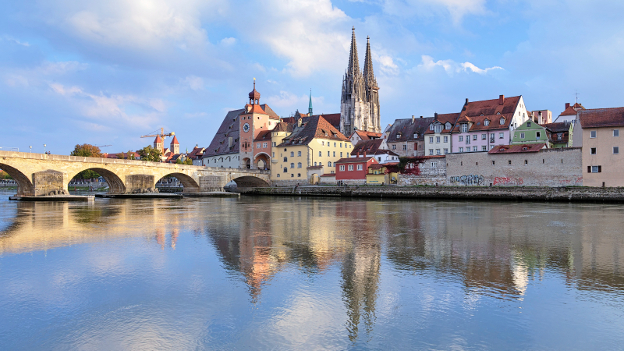 Applicants are expected to have completed two years of college-level German language studies and a minimum of three courses in German Studies (literature, history, politics or other fields) at the time of nomination. PhD students in the humanities and social science disciplines in the process of preparing their dissertation proposals on modern German topics may be nominated for the grant by their department and/or principal advisor. Students whose dissertation proposals have already been formally accepted are not eligible for nomination. The intent of the program is to provide an opportunity for short-term exploratory research to determine the viability or to delimit the scope of their proposed dissertations. The program is not intended to supplement or substitute for regular dissertation field work abroad which should lag the short-term research stay by at least one semester. Applicants are expected to have completed two years of college-level German language studies and a minimum of three courses in German Studies (literature, history, politics or other fields) at the time of nomination. Grants are restricted to citizens or permanent residents of the US and Canada who are enrolled full time at the university that nominates them. Research support ranging in value from USD 2,000 to USD 3,000 is available to individual scholarship recipients and is intended to offset living and travel costs during the active research phase. Support cannot be provided for stays in Germany in the context of study abroad programs. Application deadlines are May 1st and November 1st. Applications postmarked the day of the deadline or earlier will be accepted; those with later postmarks cannot be processed. Incomplete applications are invalid. Please note: Application materials will not be returned, and no reasons for a decision will be given. DAAD will announce its decision approximately eight weeks after each deadline. If possible all parts of the application form should be electronically generated, typewritten, or otherwise neatly printed. Confidential letters of recommendation and official transcripts should be forwarded in sealed envelopes. Please do not staple any of the application materials. Two letters of recommendation, including one from the professor supervising the German Studies curriculum or the research project. Please ask your reviewers to send a scan of the signed letter to grubersliva(at)daad.org. DAAD language evaluation form ("Sprachzeugnis"). The language evaluation form is a mandatory part of the application form, and must be completed and signed by a faculty member of the German Department at the applicant's institution. Important: All applications must be handed in 1) via regular mail (see address below) and 2) via email to grubersliva(at)daad.org in a single pdf-file. In order for your application to be complete, you must hand in an electronic and a paper version of your application. If you have any questions regarding the DAAD German Studies Research Grant, please send your inquiry to: grubersliva(at)daad.org.